A couple of vintage postcards picked up at a fair took me to a sleepy suburban town on the Seine that hides plenty of surprises. Picking up the postcards, it was the name that attracted me first. Elisabethville. There had to be a story behind such a name, but the photos on the cards provided few clues. Clearly the town was a recent one, with the postcards highlighting municipal architecture, apparently from the 1960s. Why did the postcard manufacturers choose to promote a town hall annex and an indoor market? Was there anything else in this town? The only way to find out would be to visit. 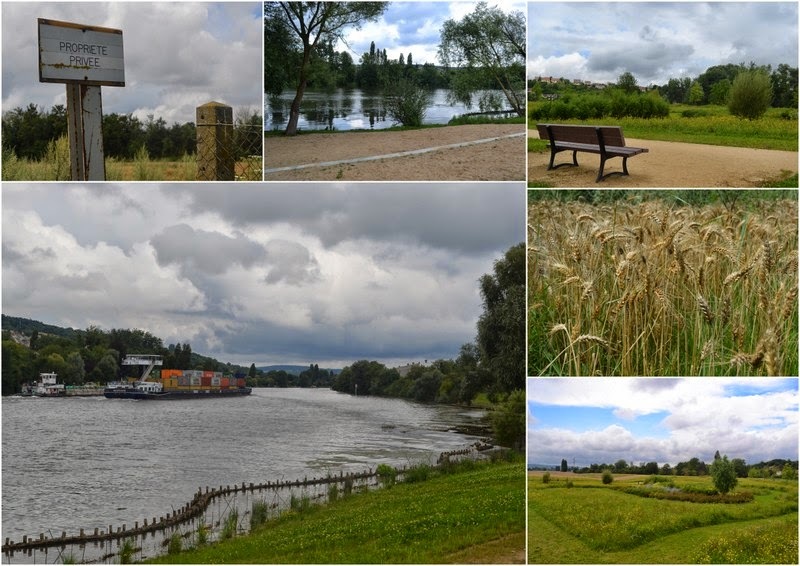 Fortunately it’s a town that was built alongside a railway station (Aubergenville – Elisabethville), so I cycled to Saint Lazare on jumped on a train. 40 minutes later, it felt as if I was already in Normandy (technically the region begins only around 20km from the town). I thought it might be tricky to locate the two spots featured on my postcards but in fact it took less than five minutes. The two places are part of the same development and back on to the train line. On a drizzly Sunday there was little to see here, but I attempted to locate the exact positions from which the pictures were taken, and could confirm that little has changed here in the last 50 years. Turning around from this spot, it seems even more difficult to understand why these two buildings were once chosen to promote the town. Perhaps there was a certain municipal pride in picking out a couple of new builds – which are, it must be said, not without merit in a holiday camp style. There was also surely a desire to highlight something recent in the town, because it had by this time become known for two other things. But let’s go back to the beginning. The story starts with a big country house – or small chateau – known as La Garenne. It can trace its history back to the middle ages, but it wasn’t until the end of the 18th century that a significant property appeared. 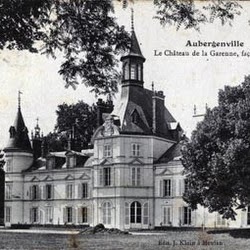 The chateau sheltered small hamlets and a large working farm, which covered the whole area of today’s town up until the end of the First World War. Indeed, it was this conflict that would forever change the aspect of this territory. Following the death of Paul Bertin, the owner of the chateau in 1908, and of Jacques, one of his sons, killed at the beginning of the war in 1914, the remaining son André decided to sell up. The property and surrounding lands were purchased in 1921 by a company who brought with them grand plans to create a garden city - and to commemorate Franco-Belgian relations during the conflict. In order to add a little prestige to the project, the group also looked for a figurehead. Elisabeth, the popular queen of Belgium - who had no links at all to the area - accepted to have the town named after her. Whether she ever visited or not is unclear. Elisabethville was marketed as a kind of Normandy before Normandy to Parisians looking to escape the city. It was – and remains – extremely residential, but it was also a place built around leisure. 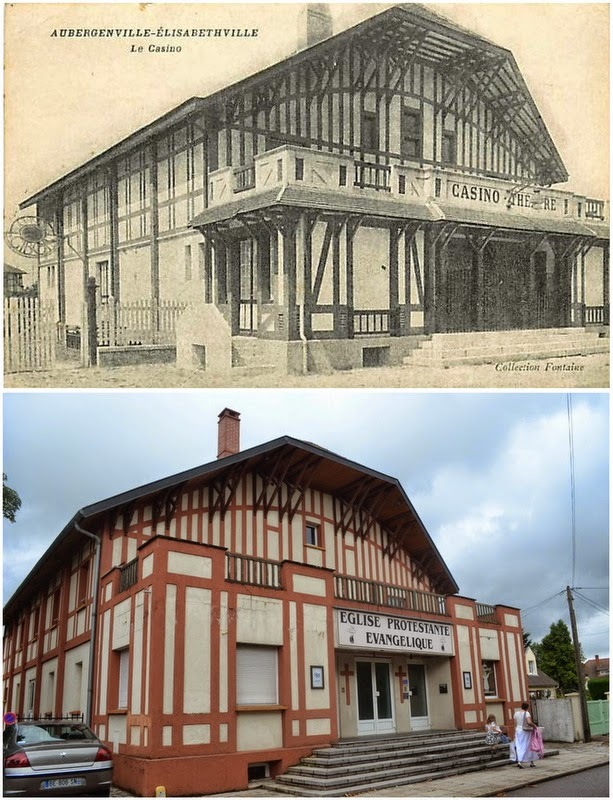 The dominant architecture is Anglo-Norman, which included not only the houses being built but also the facilities in the town (notably a casino/theatre, which is now an evangelical Church - see below). 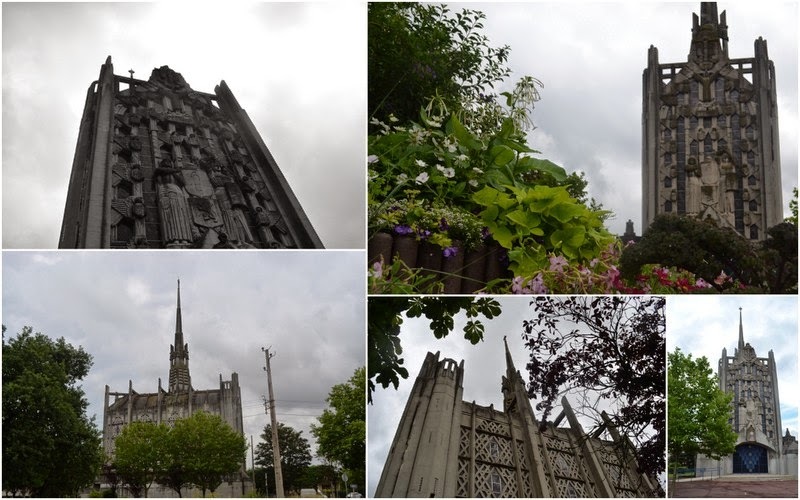 The only exception to this rule was the distinctly modern Sainte-Thérèse-de-l'Enfant-Jésus church, one of the first in the country to be made entirely of reinforced concrete. The inauguration of this building, in July 1928, was front-page news, and it remains striking, if not a little neglected. Not only is the entire building in concrete, but the sculptures on the facade were also hand-carved in the material during construction. I would have liked to look inside, but the door is firmly shut - a little unusual for a church on a Sunday. Immediately opposite the church is a street sign that provides another clue to the history of the town. Elisabethville is planned development, with roads that radiate out from the central Place de l'Etoile like bicycle spokes. Most of the street names reflect the links to Belgium - Ypres, Liege, Dixmude, but this one is different; Boulevard de la Plage. Rather than quaint architecture, fresh air, or an interest in Belgium, it was this promise of leisure that brought Parisians to the town. In some ways, Elisabethville is reminiscent of 20th century seaside resorts such as Le Touquet, so it should be no surprise to learn that its principle attraction was a beach. It is possible that this Seine-side beach was a natural feature that predated the creation of Elisabethville, but the development of this spot made it one of the key features of the overall community. 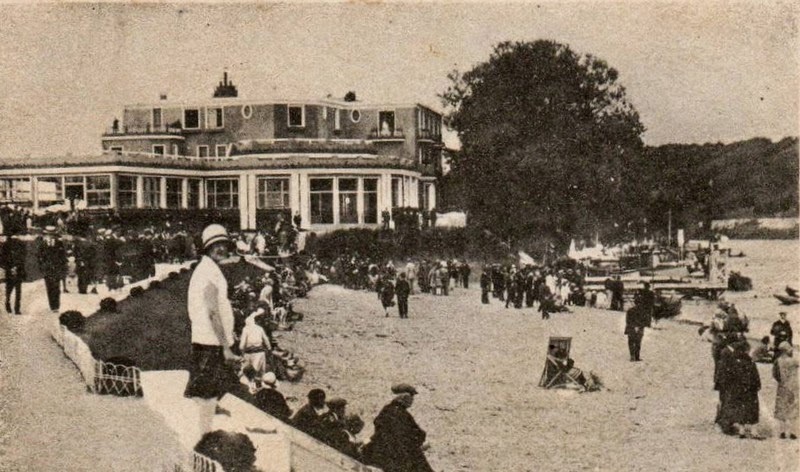 Alongside the beach was a hotel/restaurant called 'L'Ermitage', which also boasted its own 18-hole golf course. Numerous postcards from the resort's inter-war glory days can be found showing just how popular the beach was with visitors. People didn't think twice about swimming in the Seine in this period, and the Ermitage became a fashionable location. It continued to operate in the 1950s and 60s, with a swimming pool replacing the river for those wanting to take a dip (people were now becoming more suspicious about swimming in the river - possibly due to the construction of the Porcheville thermal power station in the 1950s, around 2km further west along the Seine). By the 1970s, L'Ermitage had been abandoned. I cycle along the boulevard and follow it down towards the river. The entire area has been freshly landscaped (following the demolition of the ruins of L'Ermitage), and will shortly be reopened as a park. There is nothing here to suggest that there was once a hotel and golf course, but a small amount of sand still survives alongside the river. It's a pleasant environment, surely better reflecting the natural elements of a riverside location, but there is almost no-one else around. The only other people are sitting in their cars in the parking zone, suggesting activities that I don't really want to hang around and witness. I cycle back up towards the church. 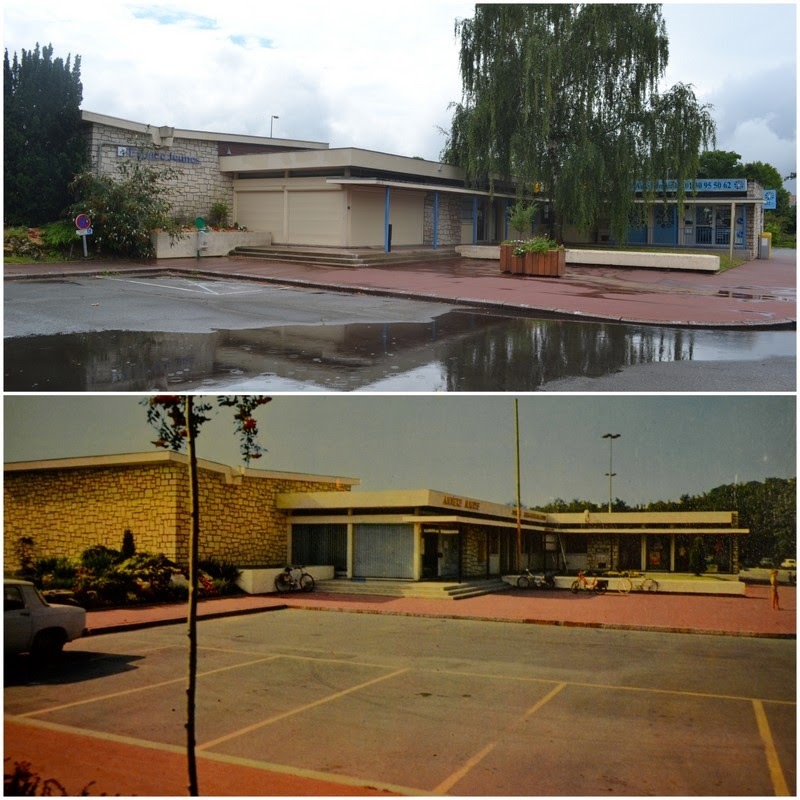 The Boulevard de la Plage leads to another interesting development, and one that shows that by the 1950s the leisure industry was becoming less important. In this decade, Elisabethville found a new economic motor - the Flins Renault car factory. This establishment - employing over 20,000 people in the 1970s - now builds the Clio and the electric Zoé. It was designed in the early 1950s by the architect Bernard Zehrfuss who also created a far more interesting (for me) project just alongsideat the same time. 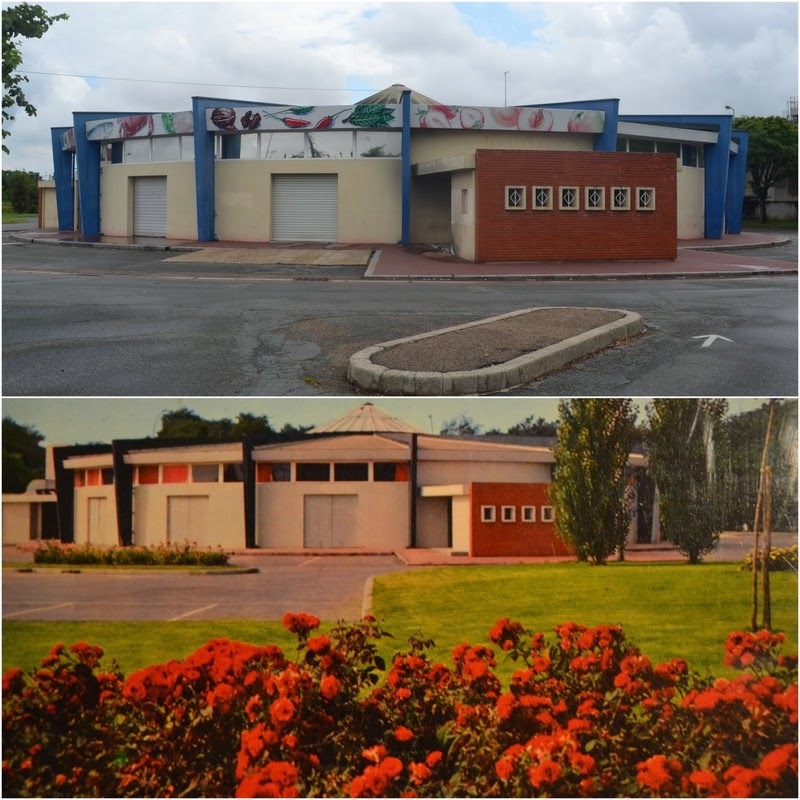 In a small area of parkland near the Boulevard de la Plage stand around 15 houses, all on pilotis. These were made for factory management, but represented a model property for car owners. Today it is still possible to immediately understand the logic, even if the spirit of the development is no longer alive. The houses had no defined private property as such and were instead individual pods in a shared environment. Each property had its own stretch of road, with room under the houses for two cars. Owning a car in this environment was the ultimate symbol of freedom, with people able to go straight from their house to anywhere they wanted to go. Nearly 100 years later – what next? Cycling around the town is an almost surreal experience. There is no-one here. I pass by a large, well-equipped sports stadium - which is devoid of people. 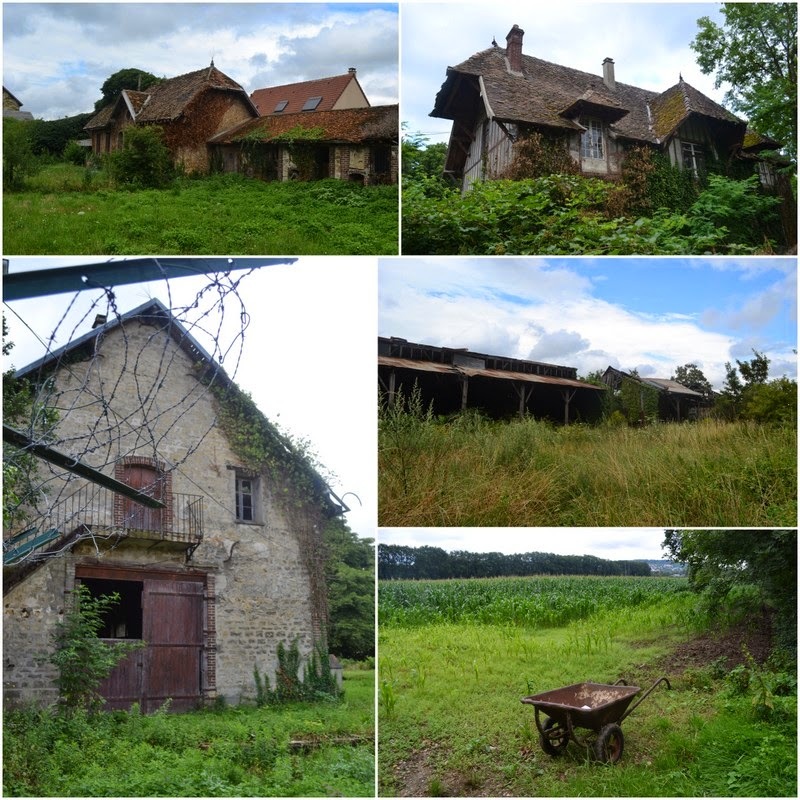 Alongside I come across an old, abandoned farm, apparently the stables and working buidlings of the old La Garenne château. The chateau has of course gone, but somewhat bizarrely the original entrance gateway remains in place. Behind these I can see a whole community of large houses. In a place where it is very difficult to imagine any kind of crime taking place, is there really a need for a gated community? Elisabethville today is clearly not the town it originally wanted to be. It's a beach resort without a beach, a place of leisure where an evangelical church has replaced a casino, and town where a vision of open architecture has now become banal suburban private property. And yet the town still seems to be a pleasant place to live. The trains to and from Paris are quick and frequent, the houses are large, the river runs gently along its northern edge and the indoor market is still in operation. Near the station I pop into the anglo-norman styled boulangerie – named 'à la reine Elisabeth', and clearly one of the original buildings in the town. I show my postcards and ask a few questions. Yes, the town hasn't changed much but it has everything they need. A friendly welcome and a smile is already more than I'm used to when asking questions, even if I can't help feeling that, like in Midwich or Stepford, there might be something hidden in this eerily quiet community. Elisabethville isn't technically a town but is instead a community shared between two different neighbouring towns; Aubergenville and Epone. Queen Elisabeth of Belgium had no links to the area, but she does have a link to an earlier subject on this blog. Her aunt died in the Bazaar de la Charité fire, and it was at her funeral that Elisabeth met her husband to be, Prince Albert of Belgium! I love the way almost any search leads on to something fascinating. Start with a postcard and end up with queens, beaches, and casinos turned into churches. Thanks for a thoroughly fascinating read. The Paul Tournon name rang a bell. So I checked my records and found that he had designed one of the most interesting structures I encountered during my tour of the concrete churches of Paris in May, 2013. It's the Eglise du Saint-Esprit at 186 avenue Daumesnil, Paris. I spent about an hour in there absorbing the otherworldly atmosphere and taking some photos (now on my Flickr account). A Google image search revealed some other very interesting works by that architect. Thank you for a very interesting article. My cousin and her husband live in Elizabethville and I have visited then (from Canada) many times. I enjoyed learning about the history of the town. I trust you will enjoy the story.